For Matt McCall, winning at Hickory Motor Speedway is nothing new. 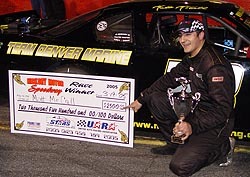 He was the 2004 Hickory Motor Speedway Late Model Stock champion and was the man to beat anytime outsiders came to the track. 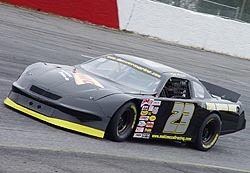 On Saturday, a lot of outsiders came to knock McCall off the Hickory Motor Speedway pedestal. Caudill and Jamie Yelton and a bunch of others. This is a big deal. This is a big win. It will sink in later when we are in the middle of tearing down the engine in post race tech. “The car was so good, a monkey could have driven this thing,” joked McCall, who works full-time in the shop for the #32 NASCAR Nextel Cup. “Harold Holly (the #32 Cup team’s crew chief) has taught me so much. We called him today and woke him up while he was napping a little bit in Atlanta. We told him that we needed more speed and we ended up changing about five things before qualifying and we picked up three-tenths (of a second). That is pretty big. McCall topped the 27 other drivers that took the green (and the 45-plus cars that tried to qualify for the event) in Saturday night’s Joe Walker Memorial 150 at Hickory, the season opener for the Southeast’s UARA-Stars Touring Series for Late Model Stock Cars. McCall started from the pole, but lost the lead at the green. It took him just seven laps to get the lead back and once he did, there was no looking back. He led until the finish to take the $2,500 payday. Once McCall got the lead, he couldn’t be touched. But even back behind the leader, there wasn’t a lot of passing going on. Second place qualifier Caudill finished second. Fourth-place starter Lee Tissot finished third and Yelton, who started fifth, finished fourth. McCall's #23 was hooked up on Saturday night. The tires were definitely a factor in lack of passing, as was the tight field. In fact, the top-20 qualifiers were separated by just three-tenths of a second. Defending series champion Jason York was one of the few front-runners that made up a few positions from start to finish. York finished fifth after starting eighth. He thought the lack of passing was due to a fact of too many cautions. There were eight cautions, including two red flags for multicar accidents, during the 150-lap race.